It was completely rebuilt by Henry Speechly in 1867, retaining the case, Great chest and most of the flue pipes. The centre tower of the case and the carving beneath it were altered at the same time. The front was moved forward, and the back panelling was pushed out into the passage to accommodate the new Swell. The resulting organ has been little tampered with. In 1926, Hill, Norman & Beard raised the wind pressure, re-voiced the reeds, replaced the pedal action with pneumatic, and provided an electric blower. 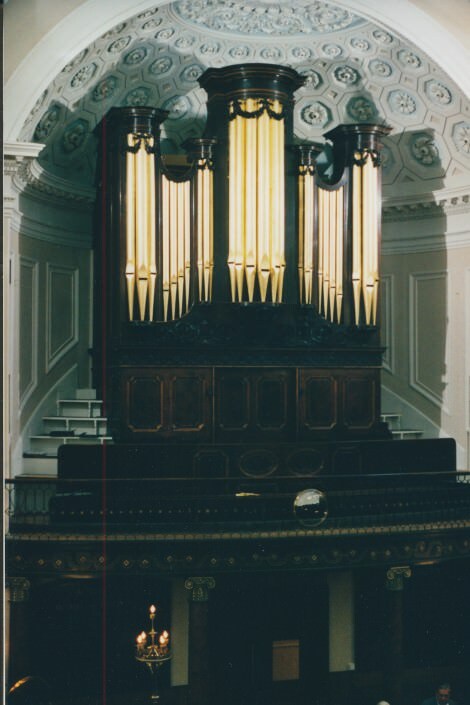 Speechly’s organ survives largely intact, though HN&B in 1926 replaced the pedal action with pneumatic (including the shared Bourdon on the Swell), and re-voiced the reeds, with loaded tongues and harmonic trebles. Cremona 1867 cº to f³, cleaned with new tongues in 1926?